I just LOVE this curry. 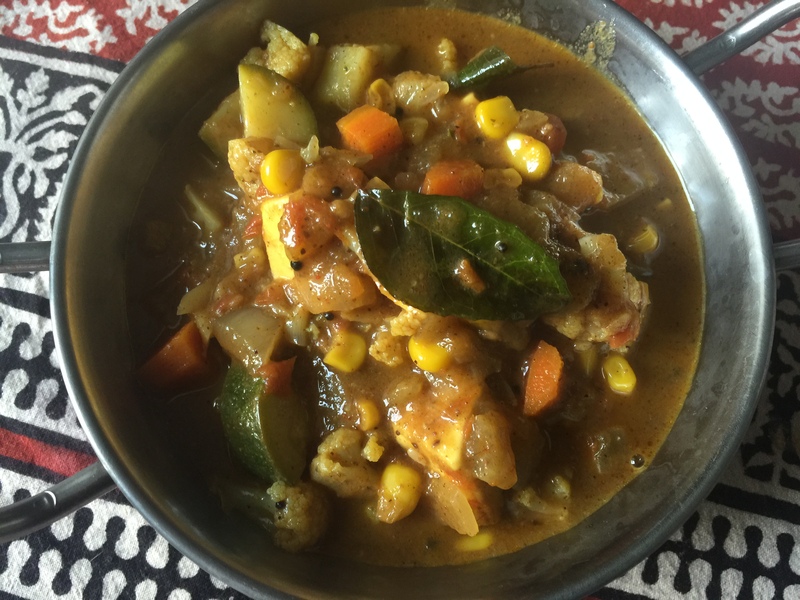 I found this recipe for Malabar vegetable curry on Cooking Love! but used this recipe on Smita Chandra for the Malabar masala since I didn’t have a box of pre-made masala. The spice blend is truly wonderful. The Malabar coast is in Kerala, South India. This curry is a little different with the corn and paneer and I didn’t have any green beans so I threw in the zucchini instead! For this recipe, I list the amounts of the ingredients in the instructions as well. I find that I’m always going back and forth when reading recipes so I thought it might be helpful to have both a recipe list and the amounts in the instructions too! 3. Add 1 tablespoon coriander powder and toast for a few seconds (it burns fast!). 4. Add all the toasted spices above and 1/4 teaspoon ground ginger and grind in a spice/coffee grinder. Heat 1 tablespoon coconut oil in a saute pan and saute 2 chopped onions until translucent, adding 1 tablespoon of minced ginger part way through cooking. Add 3 tablespoons of the Malabar masala powder, 1 tablespoon kasmiri chili powder and 1/2 teaspoon turmeric. Blend 2 tomatoes in a small food processor/mixer and add to pan. Add 3 chopped carrots, 1 diced zucchini, 1/2 can coconut milk and 1 1/2 cups of water and cook until the carrots are tender. Add 5 ounces cubed paneer and 1/2 cup corn and cook until the paneer is soft. Salt to taste. In a tadka or other small pan, heat 1 more tablespoon coconut oil. Add 1/2 teaspoon mustard seeds. When they start to pop, add 6-7 curry leaves and a pinch of hing. Throw into curry.